Do I need a fully weatherproof padlock? A fully weatherproof padlock is one that uses 100% stainless and non-corrosive materials. They are also know as marine padlocks and suitable for saline and other extreme environments. This is a common question and often the answer is no. The first thing to seize up and prevent a padlock from functioning properly is the internal mechanism. This mechanism is very small and complex, using a tiny pins and springs. When these rust or corrode they will prevent the key from operating the lock barrel correctly and eventually prevent the lock from being opened at all. However, many non-marine padlocks are perfectly suitable for outdoor use and many high-quality padlocks use non-corrosive internal mechanisms. All our ABUS padlocks use non-corrosive mechanisms and are, in fact, the same mechanisms found in the fully marine grade types. The dilemma between a standard and fully marine padlocks due to the metal used in the shackle and body of the padlock. Fully non-corrosive alloys and metals are by their nature softer and as a result can be sawn, cut or bolt cropped more easily. For example we offer two types of brass padlock. A standard type with a ‘hardened-steel’ shackle and a fully weatherproof type with a ‘stainless-steel’ shackle. They are the same size and same design but the fully weatherproof model will be more easily attacked due to the softer metal composition of the shackle. Consider this when choosing the padlock which is correct for your application. Generally we would recommend standard padlocks with hardened shackles for general outdoor use. The shackle may discolour over time but rest assured that you’re padlock is stronger and this corrosion will not affect the function. If however you plan on leaving your padlock for extend periods of time unused, by the sea, on a boat, underwater or in other extreme environments then the marine grade padlocks would be best. 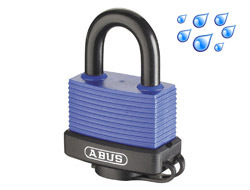 Any padlock with the ‘rain-drop’ icon is a fully weatherproof marine grade padlock. There are exceptions to the rule. Some high-end padlocks are made from hardened steel and yet still boast a fully marine grade status. 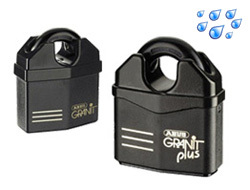 An example of these would be the ABUS Granit series. In 2009 they cataphorically coated their premier high-security padlocks which is both durable and completely covers all corrosive areas of the padlock. Accelerated tests showed that they were capable of normal function in very extreme environments for over 80 years. Remember that even a marine grade padlock is susceptible to grit, sand and dirt. For these some padlocks are encased within a plastic jacket and a guarded keyway. They are usually marine grade also and make an ideal option for padlocks which are exposed to both moisture and other solid elements.